Soil pH – The term pH comes from the French term ‘puissance d’Hydrogene’, meaning the ‘power of Hydrogen’ and is a measure of acidity or alkalinity. 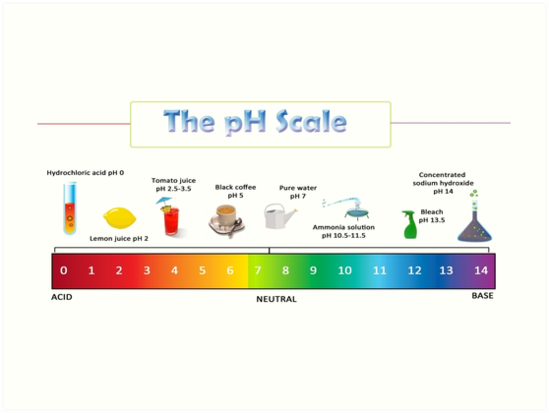 Values of pH range from 0 (extremely acidic) to 14 (extremely alkaline) with a pH level of 7 being neutral. Most gardens would have soil pH values between 5.5 (moderately acidic) to 7.5 (slightly alkaline) or 8-9 (alkaline). A soil of pH 6.5 is widely considered to be the ideal, especially for vegetable gardens. Every gardener should regularly check the pH level of their soil using a soil test kit because soil pH has a marked effect on the solubility of soil chemicals, so there can be a problem of nutrient deficiency or toxicity when the soil is at an inappropriate pH level. What happens if the soil is the wrong pH? A lot of money is spent on buying plants to grow a beautiful garden but it doesn’t matter how great these plants look in their pots, if they are planted into a soil which has a pH that doesn’t suit them, they will soon struggle and perhaps not even survive. Some plants can grow in a very wide range of pH levels but there are others that are far too sensitive and will not survive. Camellias, for example, require an acidic soil and will never thrive in soil that is alkaline. The reason for this is that the soil is made of many elements such as iron and phosphorous which all plants need but in differing amounts. Some might need more iron than others; some may require more phosphorous. But, the nutrients are released at different rates depending on the pH of the soil. For example, more iron is released in an acidic soil than an alkaline soil so if a plant that requires extra iron is planted into an alkaline soil, it won’t receive enough of this element that is so vital to it thriving. Put simply, a plant that is grown in soil that does not suit its pH requirements can’t take up the nutrients that it needs. Copious amounts of fertiliser can be added but it just won’t make any difference as the nutrients will be ‘locked up’ to the plant until pH of the soil is adjusted or it is moved to a more suitable spot. In essence, the plant will starve. Whether the plant is a vegetable, flower or shrub, if the leaves are turning yellow or its growth is stunted, there is never any point in applying fertiliser or any treatments until the pH of the soil is tested. It would be better to pour it down the drain as it’s possible that it’s never going to get taken up by the plant. Once the pH is known, the problem can be solved and the plant will return to full health. There are some other indicators of whether you have alkaline or acidic soil. If your hydrangea flowers are pale pink (no blue flowers) the area is likely to be alkaline or neutral, but if the flowers are blue, the soil in that area is acidic. Another indicator of pH is whether it is slugs or snails that eat your lettuce!!! Snail shells are partly made of calcium carbonate and they need a high calcium (Ca) pH soil. Soil pH is largely regulated by the concentrations of calcium which bind to the negative charges on the clay particles. If most of the charged clay particles bind calcium, then the soil is neutral or alkaline. On the other hand, if the soil is derived from granite or sandstone bedrock with little calcium content, or the soil is in a high rainfall area where the calcium and magnesium ions are washed away, the soils may be quite acidic (pH4.5-5.0). Lowering soil pH – (from values over 8) from soils derived from limestone or chalk tends to be more problematic but can be lowered by adding agricultural sulphur which is converted into sulphuric acid by soil bacteria, increasing the concentration of hydrogen ions in the soil. Raising the soil pH – (from values below 5) requires a regular application of agricultural Lime. Mushroom compost is alkaline, therefore would only be beneficial when used on acidic soil to take the pH level up and make it more alkaline. Peat moss is quite acidic, around 4, making it a suitable soil amendment for plants that thrive in acid soil. Cow manure is acidic and will reduce the pH of alkaline soils. Our recommendation would be for every gardener to own their own soil testing kit and use it regularly to test different areas of the garden. Soil test kits cost around $25 dollars for up to 100 tests. Here at the Sanctuary Point Garden Centre we can test your soil for free and provide the right advice to getting your soil pH at the correct levels.